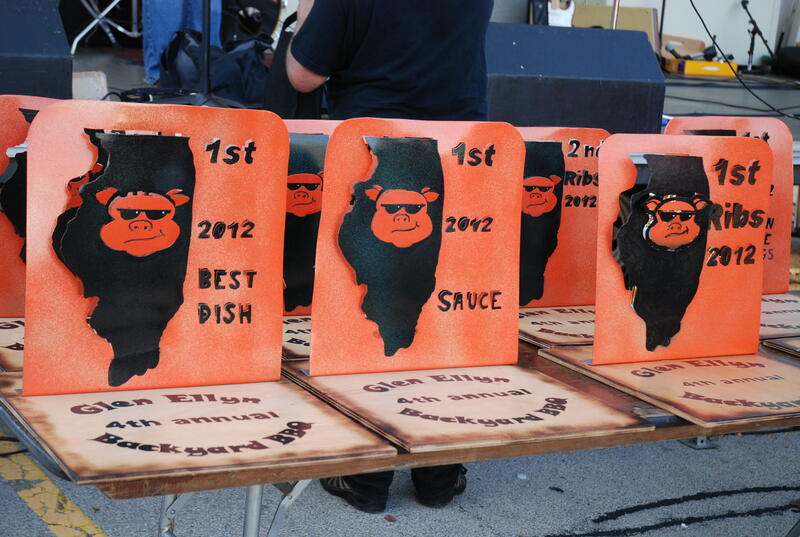 4th Annual Glen Ellyn Backyard BBQ Cook-Off was Smokin’ Hot! Tom “Pig Daddy” Koprowski and Greg “G” Bane are as excited and proud of the 4th Annual Glen Ellyn Backyard Bar-B-Q held Saturday, September 8th, as they have been for any of the three prior editions of the event. That’s really saying something as the event, inspired by a few local residents’ musings and trash talk over who made the best BBQ, grew and evolved in to quite the culinary community fun stop on the Village calendar. Vision and objectives? Sounds more like a strategic planning session than a BBQ cookout, no? “Look, it all simply comes down to a bunch of family and friends sitting around a fire, enjoying a meal and the company of others – a tradition of mankind for thousands of years,” outlined Greg Bane, the event’s co-chair. “We thought an event like this was not only a good way to settle who made the best BBQ, but it was a way to get people together, enhance and showcase what’s best about our community, tap into Glen Ellyn’s affinity for traditional American events like the 4th of July celebration, and, even give something back to others on hard times by supporting the Bridge Communities charitable works to help the homeless,” said Koprowski. According to Mark Milligan, President and Co-Founder of Bridge Communities, this year’s event raised over $25,000 to support the Transitional Housing Program of Bridge. “The Glen Ellyn Backyard BBQ proceeds will be used to provide safe housing, life-skills mentoring, educational and employment training and coaching as well as professional case management and tutoring for adults and children,” said Milligan. In fact, according to Milligan, this year alone Bridge housed more than 120 families, provided employment counseling to 55 adults, helped 38 client families find new employment and 29 enroll in college or employment training, and tutored 61 children. “This event and those who support it serves as a testament to the value our community and surrounding communities place on helping families served by Bridge,” stated Milligan. No bones about it though, Koprowski makes it very clear, that the spirit of the GEBBBQ is flavored by the generous spirit of the “Bar-B-Crew”. The volunteer organizing committee of this event helped it to both grow and retain its friendly, neighborhood vibe. The “Crew” first started out mostly as neighbors on Koprowski’s block, where the first two Backyard BBQ’s were held as neighborhood block parties. 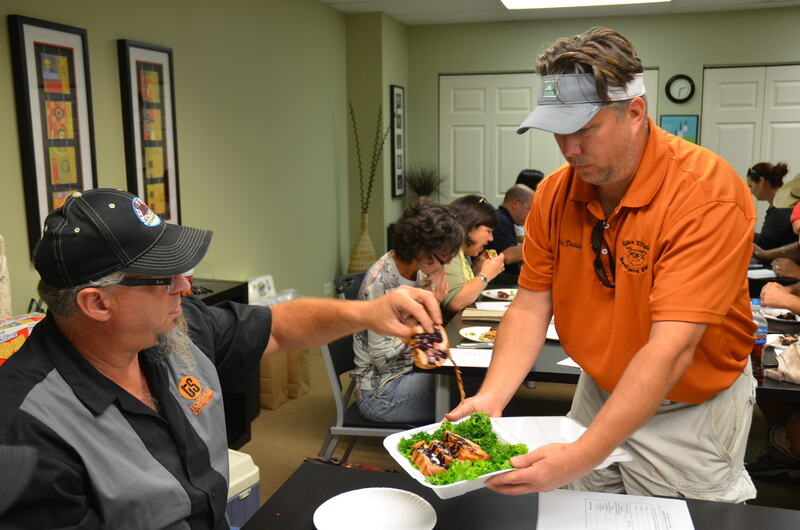 “The group has grown to include others with a passion for BBQ or just wanting to help the event and the Village. Due to this team effort, the event has grown to four bands, 46 teams of contestants, a bags contest, four food vendors, beverage sales, a number of big sponsors, and really cool awards. Their story of the start and growth of the event brings to mind the old, medieval, folk tale of “Stone Soup” where the local people of a town end up giving food to hungry strangers after first being unwilling to share. However, once a pot, a stone, some water, and fire are assembled, the townsfolk are drawn out, and, eventually more and more villagers appear, each adding another ingredient upon suggestion. Finally, a delicious and nourishing pot of soup is enjoyed by all. Substitute BBQ for soup, and, a grill for the pot, stone and water and you have the Backyard BBQ version of the story. Neighbors and community members keep coming forth to turn it into the huge community event it is today, enjoyed by growing numbers of people from both within the Village of Glen Ellyn and from the metropolitan area at large. The growth of the event is being propelled thanks to personal, strong, positive word of mouth and social media support, and, public plugs such as the one by Buzz Kilman (whose band played the event) on Jonathon Brandmeier’s show on WGN Radio and others by WDCB Radio 90.9FM College of DuPage. 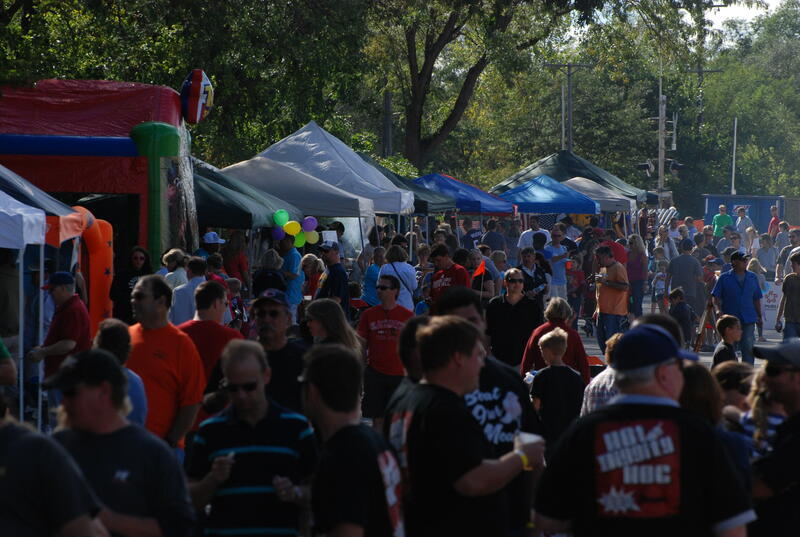 The 4th Annual Glen Ellyn Backyard BBQ expanded its footprint this year to not only encompass the Glenwood Ave. Parking lot as it had in year three, but the street adjacent to the parking lot between Prospect and Glenwood Aves. 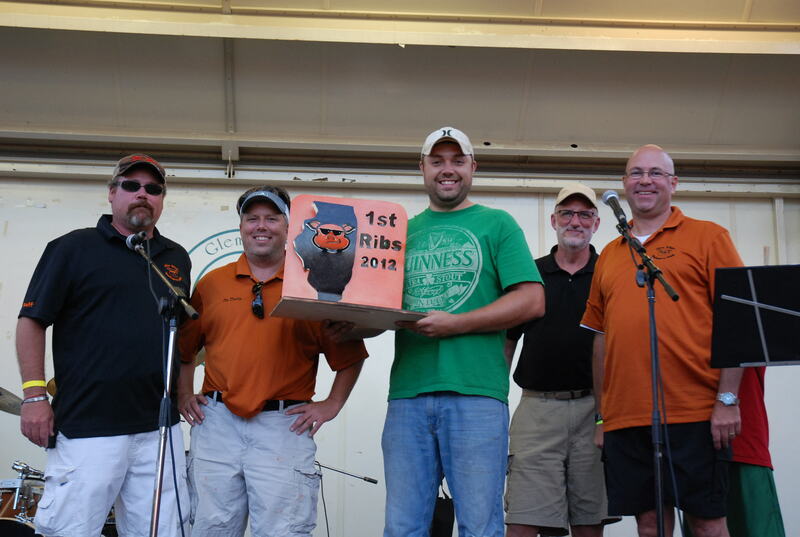 It also saw 46 BBQ teams enter, up 6 from last year with the number of out-of-town teams increasing from 28 to 33 while Glen Ellyn teams increased from 12 to 13. Teams came from as far as Yorkville, Huntley and Normal as well as Cook, DuPage, Kane and Will counties. The level of culinary competitiveness was high and challenged the team of judges to select the winners. Food categories were Best Pork Ribs and Best Dish. A People’s Choice BBQ Sauce category was added this year. According to Bane, “BBQ is a very all-American and traditional pursuit the general public enjoys in the backyard. 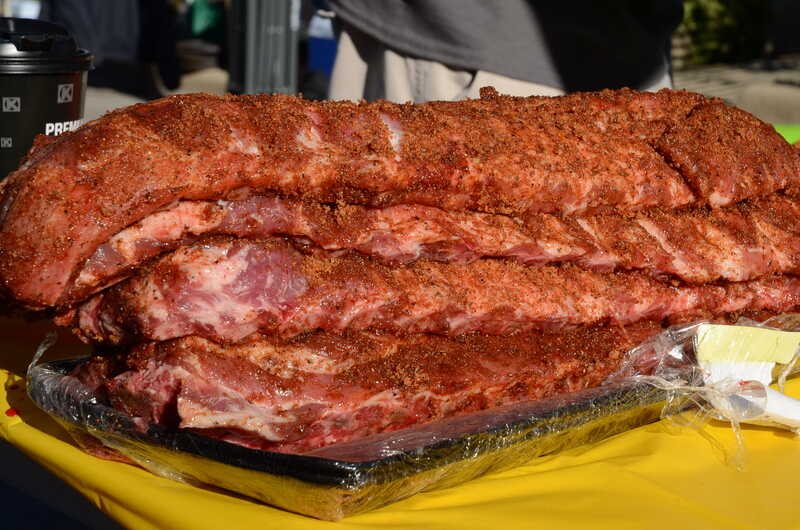 You don’t have to cook or compete to enjoy BBQ, you just have to like to hang out and eat tasty food.” And that’s exactly what had happened, as an estimated 2,000 people enjoyed the smell, sounds and tastes the event had to offer. Food vendors including Brand BBQ Market of Chicago; Smokin’ Wills of Roselle and two local favorites – Tap House Grill and Skuddlebutts both of Glen Ellyn sold grilled and BBQ fare to the public. “By the end of the day, each of our food vendors completely sold-out,” stated Bane. “It’s unbelievable and a testament to the event’s popularity,” he added. “All of this means more money raised for Bridge Communities, the event’s beneficiary,” stated Bane. 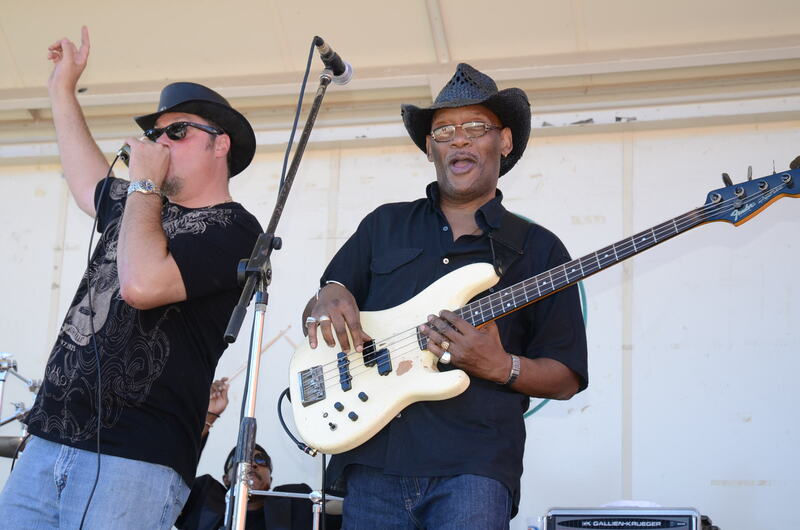 Of the four blues bands that played throughout the day, two involved former Glenbard grads. Dave Englehardt of Cadillac Dave and His Chicago Redhots is an alum of Glenbard South while Amy Kelly of Amy Kelly and the Bill Ande Band is an alum of Glenbard West. “How cool is that?” added Koprowski. Aside from Buzz Kilman who knocked it out the park playing his harp and singing the blues, another well know celebrity David Raymond a.k.a. “Sweet Baby Ray” was present walking the crowd promoting Operation BBQ Relief and the newly formed Illinois BBQ Alliance. Raymond stated that he was impressed with event and has several ideas he’d like to share with the group at their next planning meeting to help propel the event along even further. Judges for Best Ribs were all certified Kansas City BBQ Society judges and for Best Dish, local celebrities and culinary enthusiasts such as: Mark Pfefferman, Village President; Victoria Martin, private executive chef; Charity Smith, owner of Brand BBQ Market; Will Sahli, owner of Smokin’ Wills; Danny Glover, owner of Skuddlebutts of Glen Ellyn; Jill Fource, owner of Marcel’s Culinary Experience ; Kelly Sears, professional chef and Christina Tallarico, food blogger and as seen on WTTW’s “Check Please” took part. Sponsors include: Glen Ellyn Bank and Trust, Advanced Healthcare Associates, WDCB Radio 90.9FM College of DuPage, Pirate 50 Trophies, The Abbey Resort – Avani Spa, B.R. Ryall YMCA, Glancer Magazine, Stubb’s, Mikeska’s BBQ, House of Graphics, 360 Digital, Euclid Beverage, Weber Grill, Skuddlebutts, Tap House Grill, Bane Design, Dixie Meat Rub, LLC, , 26 Hot-Glen Ellyn Hot Yoga, Q BBQ, Standard Market, Chicago q, Flour + Wine, Top Shelf Specialty Foods, S&S BBQ Spice and Sauce, Mike’s Gourmet Meats, Two Fat Guy’s BBQ Sauce, Village Links, Lou Malnati’s, Suzette’s Creperie, Egg’lectic Café, AliKat, Studio Movie Grill, P. & E. Mullin’s Local, TownTees, Professional Paving, Guy Fieri and Esquire M.E.N.S. Barber Shop.